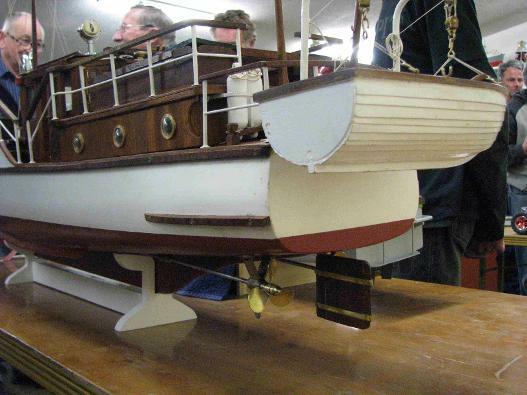 Noel Wonnacott's fine model of Bluebird of Chelsea. 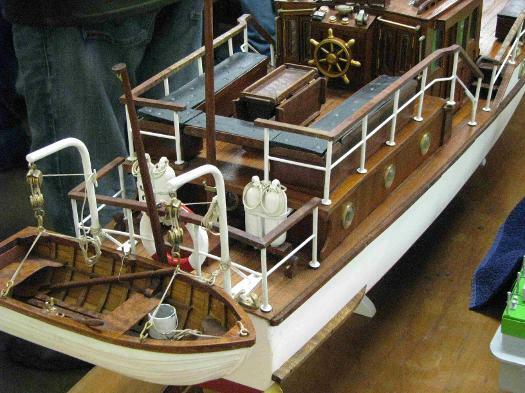 This model won the Harrison Cup for the best Model Boat and the Curry Cup for Best Overall Model at the 2012 CSMEE Awards. 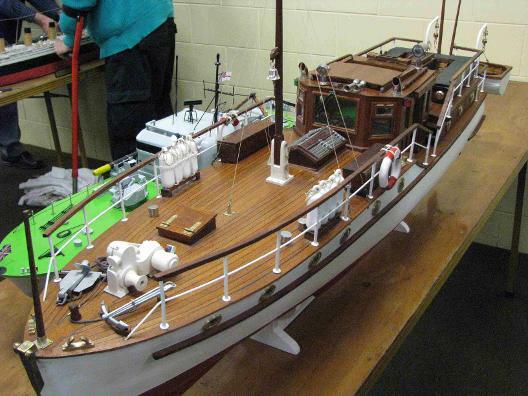 Noel based his model on the plan feature by David Metcalf that was published by Model Boats magazine in 1989. Noel doubled everything to end up with a model that is about 1400mm long at a scale of 1" to the ft. Noel reports that the plan was very good with lots of detail but had one or two errors which he corrected. Making it a larger model made it easier to make some of the detail. The model is driven by two geared electric motors each powered by a 12v gel cell. Each motor has its own speed control and these are mixed in with the rudder as well as the throttle. The original Bluebird of Chelsea was built by Thornycroft in 1931 for Sir Malcolm Campbell, world land and water speed record holder. The name Bluebird was given to all his record-breaking cars and boats and the three successive yachts he owned. 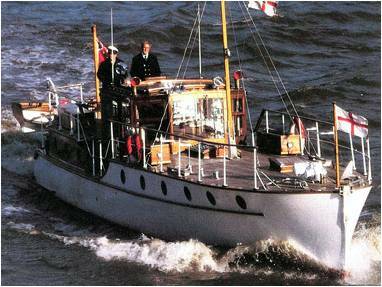 Bluebird of Chelsea (her present name) was Malcolm Campbell's second yacht. He sold her after only three years as his motor racing experience made him wary of the petrol engines aboard. He was also highly superstitious and believed a gypsy warning that "his death would come from the water". 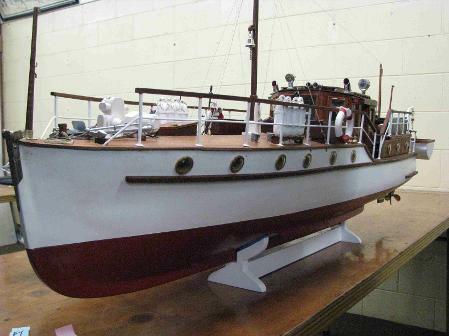 She had three further owners before being requisitioned by the Admiralty at the outbreak of World War II. Soon she was on her way with the flotilla of "little ships" to Dunkirk. Not without two false starts though, first due to engine trouble and then over-crowding. Her return from Dunkirk was even more fraught: after first refilling the fuel tanks with water, then fouling her screws on debris, she returned under tow. 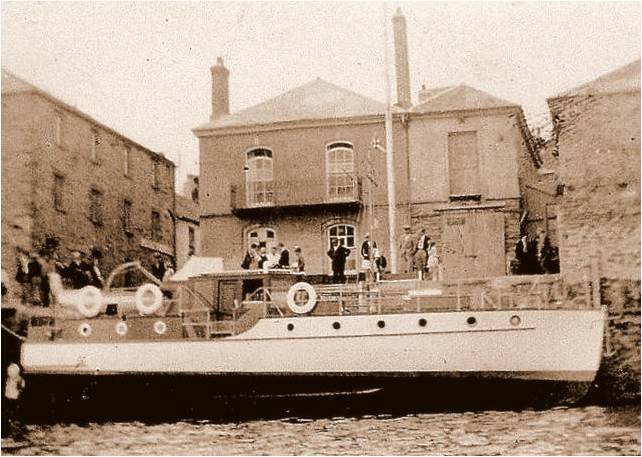 Her later wartime service was spent in Scotland performing transport work then later on the South coast around Weymouth and Gosport. Her history after this is sketchy, although she was renamed Blue Finch and found herself on the Atlantic coast of the South of France. In 1984 the Chelsea art dealer Martin Summers discovered her in France and decided to restore her. Some initial work in France made her apparently fit for a single-engined Channel crossing, but once again another engine failure meant that she returned from France under tow. 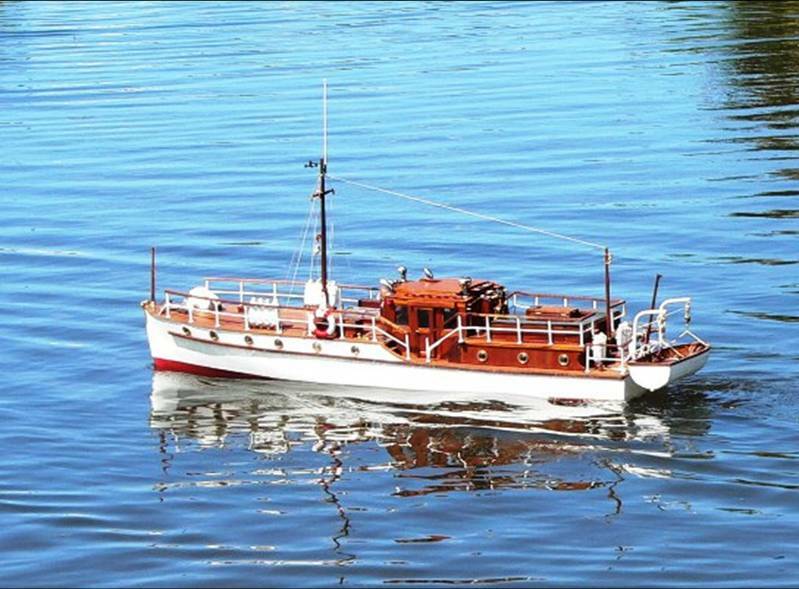 After an extensive restoration, to the very highest quality, she was re-launched in 1986. She now lies alongside Cadogan Pier in Chelsea. Her condition today continues in this fine tradition of quality. Bluebird of Chelsea is 52ft long with a beam of 11ft. Displacement is 23.42 tons. She was built of double mahogany on Canadian rock elm. Her original petrol engines have been replaced and she is now powered by two Perkins 6345 diesels.